1 A None No Power Seat 1 A is a standard First Class suite however, the close proximity to the lavatories and galleys may be bothersome. 1 D None No Power Seat 1 D is a standard First Class suite however, the close proximity to the lavatories and galleys may be bothersome. 1 G None No Power Seat 1 G is a standard First Class suite however, the close proximity to the lavatories and galleys may be bothersome. 1 K None No Power Seat 1 K is a standard First Class suite however, the close proximity to the lavatories and galleys may be bothersome. 10 A None No Power Seat 10 A is a standard Business Class seat however, the close proximity to the lavatories and galleys may be bothersome. 10 C None No Power Seat 10 C is a standard Business Class seat however, the close proximity to the lavatories and galleys may be bothersome. 10 D None No Power Seat 10 D is a standard Business Class seat however, the close proximity to the lavatories and galleys may be bothersome. 10 G None No Power Seat 10 G is a standard Business Class seat however, the close proximity to the lavatories and galleys may be bothersome. 10 H None No Power Seat 10 H is a standard Business Class seat however, the close proximity to the lavatories and galleys may be bothersome. 10 K None No Power Seat 10 K is a standard Business Class seat however, the close proximity to the lavatories and galleys may be bothersome. 24 A None No Power Seat 24 A is a standard Premium Economy Class seat that may have restricted legroom due to the position of the bulkhead. 24 C None No Power Seat 24 C is a standard Premium Economy Class seat that may have restricted legroom due to the position of the bulkhead. 24 D None No Power Seat 24 D is a standard Premium Economy Class seat that may have restricted legroom due to the position of the bulkhead. 24 E None No Power Seat 24 E is a standard Premium Economy Class seat that may have restricted legroom due to the position of the bulkhead. 24 G None No Power Seat 24 G is a standard Premium Economy Class seat that may have restricted legroom due to the position of the bulkhead. 24 H None No Power Seat 24 H is a standard Premium Economy Class seat that may have restricted legroom due to the position of the bulkhead. 24 K None No Power Seat 24 K is a standard Premium Economy Class seat that may have restricted legroom due to the position of the bulkhead. 28 A None No Power Seat 28 A is a standard Economy Class seat however, the close proximity to the lavatories may be bothersome. 29 D None No Power Seat 29 D is a standard Economy Class seat that has extra legroom due to the exit however, the close proximity to the lavatories may be bothersome. The tray table is in the armrest, making the armrest immovable and slightly reducing seat width. There is no floor storage for this seat during takeoff and landing. 29 E None No Power Seat 29 E is a standard Economy Class seat that has extra legroom due to the exit however, the close proximity to the lavatories may be bothersome. The tray table is in the armrest, making the armrest immovable and slightly reducing seat width. There is no floor storage for this seat during takeoff and landing. 29 F None No Power Seat 29 F is a standard Economy Class seat that has extra legroom due to the exit however, the close proximity to the lavatories may be bothersome. The tray table is in the armrest, making the armrest immovable and slightly reducing seat width. There is no floor storage for this seat during takeoff and landing. 29 G None No Power Seat 29 G is a standard Economy Class seat that has extra legroom due to the exit however, the close proximity to the lavatories may be bothersome. The tray table is in the armrest, making the armrest immovable and slightly reducing seat width. There is no floor storage for this seat during takeoff and landing. 3 A None No Power Seat 3 A is a standard Business Class bulkhead seat. 3 C None No Power Seat 3 C is a standard Business Class bulkhead seat. 3 D None No Power Seat 3 D is a standard Business Class bulkhead seat. 3 G None No Power Seat 3 G is a standard Business Class bulkhead seat. 3 H None No Power Seat 3 H is a standard Business Class bulkhead seat. 3 K None No Power Seat 3 K is a standard Business Class bulkhead seat. 30 A None No Power Seat 30 A is a standard Economy Class seat that has extra legroom due to the exit however, the close proximity to the lavatories may be bothersome. The tray table is in the armrest, making the armrest immovable and slightly reducing seat width. There is no floor storage for this seat during takeoff and landing. 30 C None No Power Seat 30 C is a standard Economy Class seat that has extra legroom due to the exit however, the close proximity to the lavatories may be bothersome. The tray table is in the armrest, making the armrest immovable and slightly reducing seat width. There is no floor storage for this seat during takeoff and landing. 30 H None No Power Seat 30 H is a standard Economy Class seat that has extra legroom due to the exit however, the close proximity to the lavatories may be bothersome. The tray table is in the armrest, making the armrest immovable and slightly reducing seat width. There is no floor storage for this seat during takeoff and landing. 30 K None No Power Seat 30 K is a standard Economy Class seat that has extra legroom due to the exit however, the close proximity to the lavatories may be bothersome. The tray table is in the armrest, making the armrest immovable and slightly reducing seat width. There is no floor storage for this seat during takeoff and landing. 41 D None No Power Seat 41 D is a standard Economy Class seat that may have restricted legroom due to the misalignment with the row in front. 41 E None No Power Seat 41 E is a standard Economy Class seat that may have restricted legroom due to the misalignment with the row in front. 41 G None No Power Seat 41 G is a standard Economy Class seat that may have restricted legroom due to the misalignment with the row in front. 46 A None No Power Seat 46 A is a standard Economy Class seat in the last row of the aircraft. The close proximity to the galleys may be bothersome. 46 C None No Power Seat 46 C is a standard Economy Class seat in the last row of the aircraft. The close proximity to the galleys may be bothersome. 46 D None No Power Seat 46 D is a standard Economy Class seat in the last row of the aircraft. The close proximity to the galleys may be bothersome. 46 E None No Power Seat 46 E is a standard Economy Class seat in the last row of the aircraft. The close proximity to the galleys may be bothersome. 46 G None No Power Seat 46 G is a standard Economy Class seat in the last row of the aircraft. The close proximity to the galleys may be bothersome. 46 H None No Power Seat 46 H is a standard Economy Class seat in the last row of the aircraft. The close proximity to the galleys may be bothersome. 46 K None No Power Seat 46 K is a standard Economy Class seat in the last row of the aircraft. The close proximity to the galleys may be bothersome. This aircraft is equipped with Audio/Video on Demand (IMS/Zodiac RAVE or Panaonic eX2) which offers up to 400 CDs, audio books and 21 radio channels. This system is available via personal screens located in the seat backs. This aircraft is equipped with Audio/Video on Demand (IMS/Zodiac RAVE or Panaonic eX2) which offers up to 100 movies, 200 TV Programs, 15 games and several live TV Channels. The entertainment content is available in up to 25 languages. The system is available via personal screens located in the seat backs. On Board Wifi is available in all classes via FlyNet®. The free FlyNet® portal also offers live TV channels, news and other services. Charges for internet usage apply and can be purchased by credit card or by redeeming Miles & More reward miles via your laptop, tablet or mobile device. For further information please visit: lufthansa.com/FlyNet. This aircraft is operated in a four class configuration with 8 First Class suites, 42 flat bed Business Class seats, 21 Premium Economy seats, and 145 standard Economy seats. The legroom was severly limited by having 2 electrical outlet boxes under the front seat. Row 27 is awesome. It is an economy seat but its in the premium economy cabin. You get Premium economy leg room for economy pricing. Plenty of legroom in 24G, but the footrest is a little too short to use comfortably for a red eye. Flight attendants use the area in front of you to pass through, so occasional kicks to the feet are possible. 27K is one of the best seats in economy. Full size prem. economy screen, endless leg room, and tray table in the arm rest. NO BULKHEAD. All side seats (A,C,H,K) from row 40 to 46 are narrower than standard. These should be marked red on this plane. Moreover, due to the bending and narrowing aisle, people and flight attendants will frequently bump into you if you sit in the aisle seats (C,H). 40H was truly horrible. I do not think Lufthansa gets what premium economy is. Their service provides the absolute minimum. My Seat 52D was very good BUT the couple in the middle two seats next to me had a baby that because of the tight space against the bulkhead could not put the baby down. It screamed all night. LH Premium Economy is simply superb. Seat pitch and comfort is excellent. Just may be limited if the person in front you fully reclines. But you still have plenty of space in this case. PTV is very good. Service is 5 star like. Quality of meals and drinks are outstanding. Very nice FA's. In my opinion it's worth every single penny, feels like Business 10 years ago! I fly on this type of aircraft very often (about 12 times a year) seat 35K is a great option if you don't clear your upgrade, there is very little foot traffic, the legroom seems to be a bit better, and there is no entertainment box in the seat in front of you. it was perfectly bearable for the 9-hour flight. This aisle seat has the entertainment system box under the front seat which reduces the space for extending your legs. Thi only happens on the middle sectio with 3 seats. The middle section with fours seats is ok. These seats just behind premium economy are wonderful for economy! More legroom than you can imagine. More than the premium eco seats in front of you. It says bulkhead may limit legroom but there is no bulkhead there. Restrooms are behind you but since you are in a tiny self-contained section of the plane there is very little traffic or congestion there. Good for sleeping on a long haul in economy. Worth the $67 additional we paid. Booked this seat last year and got upgraded to it on a recent flight. Had I known what seat it was I would have refused the upgrade as I am a window seat person who seldon leaves his seat, even on flights in excess of 10 -12 hours. In this seat you are exposed to people using the ailse, partucularly stewardesses and stewards passing through into business class. Your left leg is almost in the aisle unless you sit askew. Even then, the dividing curtain brushes your left foot (6' 1" - 1.86m). Bulkhead seat too, which encourages people to try to use it as a thoroughfare. Nice gesture but I'll be consulting Seat Gurn before accepting any Premium Economy upgrades in future. Business class upgrades? A different kettle of fish. Due to the shift in the location of the aisle when the cabin transits from business to premium economy, my left leg were right in the aisle where cabin crew were passing, waking me up every time someone passed. This might be one of the worst seats I have ever had during a flight. I'd much rather have had a normal economy seat! First time in LH Business after usually flying United. I am 6'3", moderately built, but this flat bed made me feel like I was in a coffin, or in a sardine can. The footrest the bed extends into is in a triangular shape, so as I tried to stretch out my legs, laying on my side, my toes were caught up in the apex of this triangle, and adding hard corners left and right from various consoles, just made me feel uncomfortable, I could hardly sleep. Apart from that, service was LH friendly and excellent, food was 3*, bedding was top notch, but I will avoid this plane in the future. Glad I flew on miles. There is the media box under the the seat in front of you limiting the leg space. 26 A is the last row of the premium economy class on this aircraft, other than that, it's pretty much standart premium economy with all amenities. I disagree that no one can recline into you, though. If the one in front of you reclines fully and even jumps against his seat to recline even further, then you can feel restricted pretty much. One can say, why didn't you recline as well? Because in 27 A, a pretty rude giant man was seated with awfully smelling feet, which he loved to put under my armrest and continued to do so through complaints. I did not want to move further back to him. Furthermore, for 27A, there is NO bulkhead. This I would rate "green". It's not the aircraft that make flights bothersome, it's the guests. Compared to AA's old bucket of bolts 767 on the DFW to FRA run, this was the difference between an ox cart and a Bentley. Flew premium economcy, could have just as well been business class. 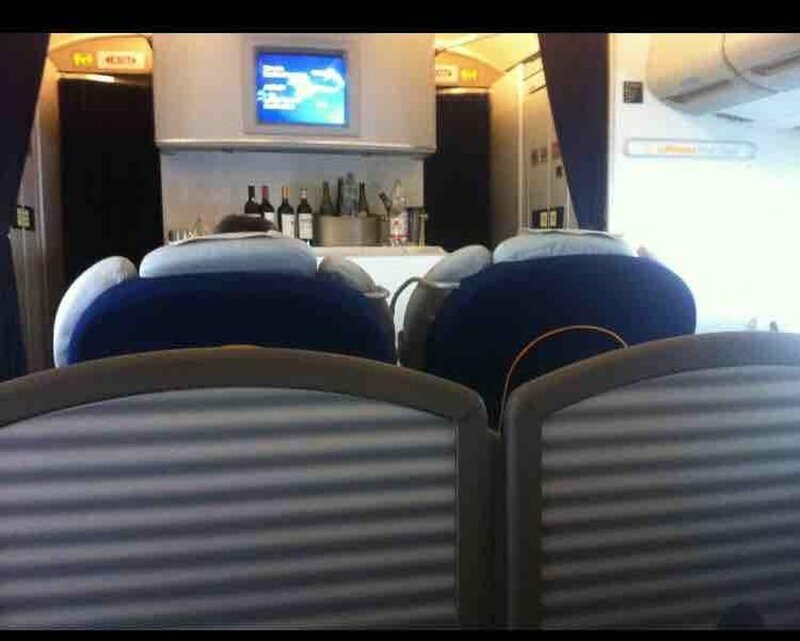 Beats AA 767 business class which I have used too. I'm about 6'1, 250 lbs and had plenty of room. Airplane was like new, very clean. Service superb, flight attendants very nice and efficient, great amenities, seats actually comfortable. Didn't feel like a prisoner on a train to a Siberian gulag like on AA. Supposedly AA has upgraded to 777 for this run but they have punished my wife and me one too many times. Will probably stick with Lufthansa and use AA only if no other option available. I really like the LH Premium Economy seats! The extra recline is great and these seats have plenty of legroom and no one reclining into you. (The footrests could go a little higher, though, in my opinion!) Note to Row 27: There is no true bulkhead here and the seats have the same amount of increased leg room as the premium economy seats, which looked very comfortable. 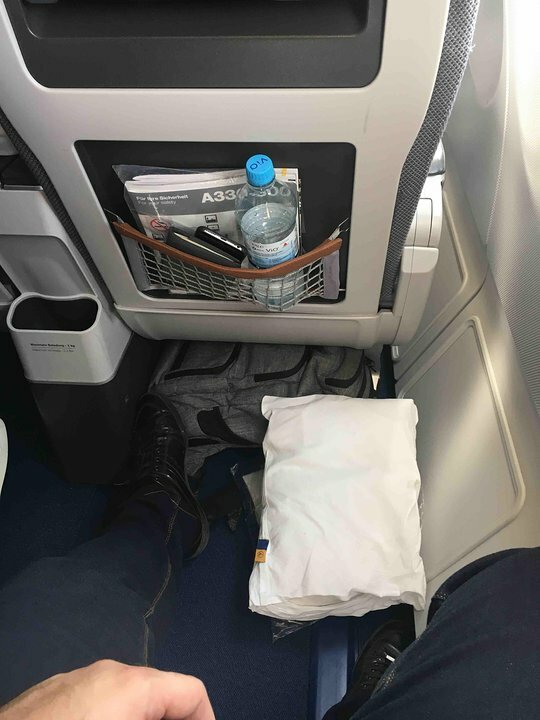 Paid 70 extra for this seat from Munich to Newark. This row has only 3 seats in the middle and is directly behind the Premium Economy, aisle is extra wide. The legroom was enormous so that I could barley reach the seat in front with my feet. Seat A,E&K have the TV in the seat in front, all others in the armrest. Service was excellent since I was served together with Premium Economy. Only negative point is the limited recline due to the Bathrooms right behind the seat. I wasn't bothered by people using the bathrooms, but avoid row 28 since these seats are directly besides the bathroom doors. For me it was definitely worth the extra money. Aisle seat right behind premium economy. IFE in armrest. Lots of legroom. Unlike other economy in the plane it is 2-3-2 rather than 2-4-2. The seat itself is not as wide as the premium economy seats so the seat is not perfectly aligned with the seat directly in front, but it was just fine anyway. SeatGuru indicates there is a bulkhead, however there is no wall, just a short screen that floats from the ceiling, so there is significant leg room. Seat 27F, the other aisle seat in the middle of the plane, has a seat rest that lifts up, so that might be better if you are traveling with your partner. All seats in row 27 have a lot of legroom, even more than in premium economy. They are populated with regular economy seats, though, not the wider premium economy ones. There is no bulkhead in front of them, so even tall people can stretch out nicely. Downside: 27D has two immovable armrests. Seats 27E and 27G have immovable armrests on the outer side, and share one foldable armrest between them. Extra legroom in Row 27 due to the positioning of the premium economy class seats ahead. Row 27 is not up against a physical bulkhead, only a mesh divider on the ceiling between the two classes. Was on this aircraft variant MUC-CLT. 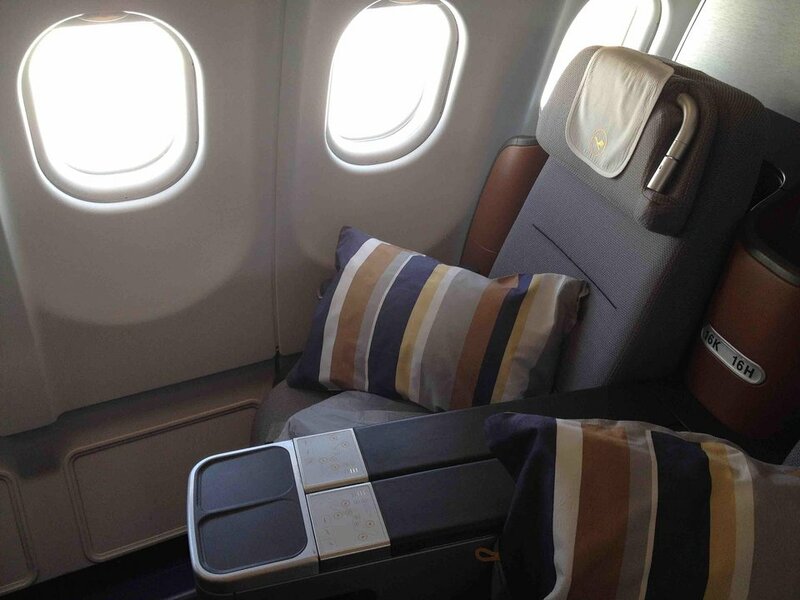 The rows 27-28 are regular economy but located in the Premium Economy "mini-cabine". There is no fixed bulkhead separating the seats to Premium Economy, only a small mesh divider. So this row has substantial legroom while being separated from the rest of Economy. Also should note that there are indeed power outlets for regular Economy located underneath the seats. The entertainment system may vary; some flights have the newer system (black frame for screens) while others may have the older system. 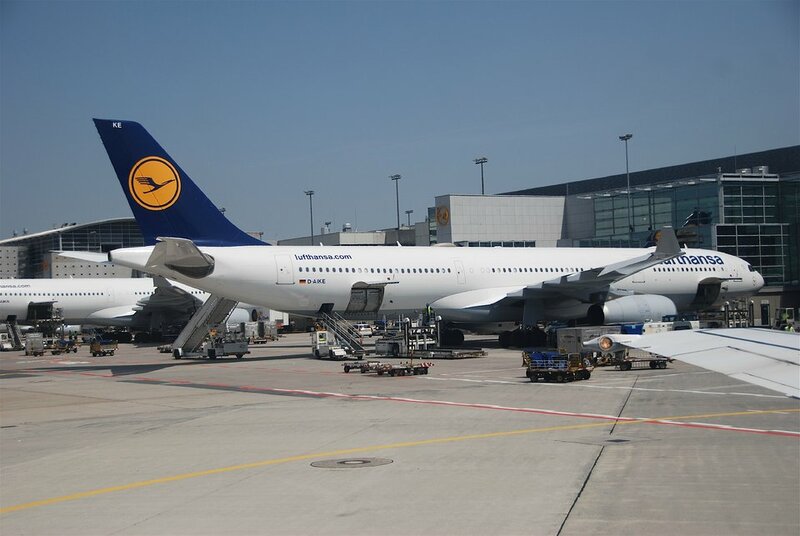 Lufthansa flies 3 versions of Airbus A330-300.